Falcon-9 v1.1(ex) is a liquid fueled orbital launch vehicle for medium sized missions, which is developed by SpaceX (Space Exploration Technologies Corp.). 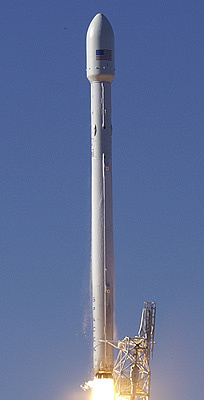 It is an improved version of the Falcon-9 v1.0 launch vehicle. Both stages are Kerosene / LOX fueled. This version is not equipped with legs for recovery. 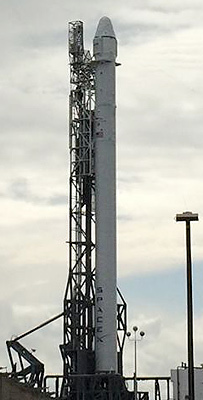 The Falcon-9 v1.1 features stretched stages and rearranged engines in stage 1. The Falcon-9 will also lift the Dragon space capsule for ISS cargo flights, which will be developed into a manned spacecraft. With the advent of the recoverable Falcon-9 v1.1, the non-reusable Falcon-9 v1.1(ex) will be employed only for missions requiring a higher performance.